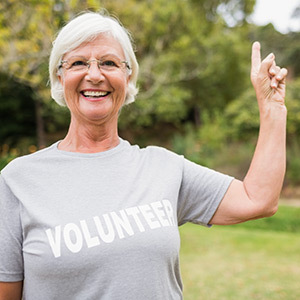 Volunteers are crucial to society, and they’re the backbone of the Osher Lifelong Learning Institute at San Diego State University. Research shows charitable work has a positive impact on happiness and well-being — and the organization benefits too. We welcome your energy, enthusiasm, and fresh ideas. And you’ll appreciate the sense of Osher ownership — it’s a win-win. Advise and provide the director with feedback and constructive ideas for achieving the institute’s mission, vision, and goals. Identify potential Osher donors. Represent the Osher membership in the curriculum development process by assisting staff in the planning of each semester’s offerings. Recommend innovative educational formats such as panel discussions, travel programs, online courses, SDSU campus department tours, etc. Increase the visibility of the Osher Institute at SDSU through outreach, community partnerships, and social media. Represent the Osher Institute at SDSU at local organizations and communities in an effort to raise awareness and increase membership. Develop strategies to recruit and retain members. Tasks will include greeting and welcoming new students, nurturing member relationships, sending welcome packets to new members, assisting with Welcome Orientation and Tour and annual member meetings, and developing member surveys. Assist Osher staff in selecting, planning, and implementing events to expand options and activities such as the Welcome Orientation and Tour, special events featuring distinguished guests (visionary leaders, authors, artists), social functions both on and off campus, and instructor appreciation events. Ensure that classes run smoothly by welcoming students and introducing instructors. Also serve as liaison between the institute and classmates, disseminate information, and motivate peers to get involved. Assist with day-to-day operations of the institute such as creating class packets, making follow-up phone calls to inquiry lists, sending welcome letters to new members, summarizing course evaluations, and sending reminder emails to students. In collaboration with SDSU University Relations and Development, develop and implement strategies to assist in achieving annual fundraising goals. We invite you to become a mentor and support an undergraduate student in his or her career development. Mentors will spend eight to 12 hours over the course of one semester to advise and coach a student in developing leadership skills, transitioning from the undergraduate program to the workforce, developing networking skills, setting career goals, and learning about specific industries and organizations as well as other areas. “The Aztec Mentor Program is a great opportunity for Osher students to help SDSU undergraduates. One thing we all have in common, if we look back, is how nice it would have been to talk to people in our fields of interest. It’s a great opportunity for Osher Institute members to get in touch with a young, vibrant group of people who will be ruling the world in the not too distant future. For more information, please visit the Aztec Mentor Program. Conversation Groups at the American Language Institute are designed to give international students practice in conversing with native speakers and other English-language learners. Supervised by ALI staff, the sessions are lightly-structured, with topics and questions to guide the small group discussions. Students also have a chance to ask questions and explore topics of interest. Volunteers are selected to work with two to five students each session. On some occasions, games and other activities are integrated. Refreshments are served at each meeting. For more information, fill out the ALI volunteer form or contact Alan Schuchman at alistudentlife@sdsu.edu. The length of the homestay varies and depends on the student’s length of study. For more information, contact Tuyen Nguyen, Housing and Student Life Coordinator. Email alihousing@sdsu.edu, call (619) 594-1967, or visit ali.sdsu.edu/homestay. For more information on leadership and volunteer opportunities, please email osher@sdsu.edu or call (619) 594-2863. The Osher Institute at SDSU invites the gathering of keen educators and people with a broad array of life experience. The program inspires discovery, serves the curious, and is a real San Diego gem! Eddie Baca is a retired airline pilot who’s now a partner in The Talon Group. Who says you can’t relive your college days, or you just missed the opportunity the first time around! Osher provides quality courses by professional instructors in a friendly and supportive academic environment on a major university campus. The combination of comfortable classrooms, parking, well-qualified seasoned instructors, interesting topics, and adult learners with diverse backgrounds and life experiences provide for a rich learning environment and interaction. Over the last few years, the variety of classes, instructors, and classmates have provided a very fulfilling enrichment to my life, and created a desire for me to give back to the Osher program. I have enjoyed both teaching and taking classes with the Osher Institute at SDSU now for seven years. It has been both intellectually stimulating and a fun source of social bonding for me. Above all, we are a community of supportive friends who share enthusiasm, ideas, and inspiration in our common thirst for lifelong learning. Denny Braun is an author and retired professor of sociology and economics. As a retired educator, I love the opportunity to continue learning — taking courses on an even broader range of topics than my earlier university experiences! The topnotch instructors and curious classmates create stimulating classes and an enthusiastic learning community. Osher has been an ideal addition to retirement. Gayle Coonce is a retired special education administrator. Osher has been a great way for me to keep the neurons firing, explore new information across a large array of subjects, update knowledge that may have timed-out, and bounce ideas off a remarkable collection of uniquely aged minds. Peter McQuaid is a retired public school teacher/administrator. I love the Osher Institute at SDSU classes. There is a broad range of topics and subjects. It’s such a treat to be able to take so many classes across so many subject areas. The instructors are informative and stimulating. The classmates are there to learn and engage in thoughtful exchanges. It all adds up to a terrific learning environment.